Gus Sloan Founder, Lauren Dary, audited her closet. Read on to find out how it affected her as a consumer and a designer. We are so fortunate to have the incomparable Marielle taking over our blog content! If you find yourself standing in front of your closet, overwhelmed and uninspired, you’re not alone. Somehow between the can’t-pass-up-deals and the need-a-new-outfit-for-every-outing mentality, we’ve ended up with massive closets and nothing to wear. 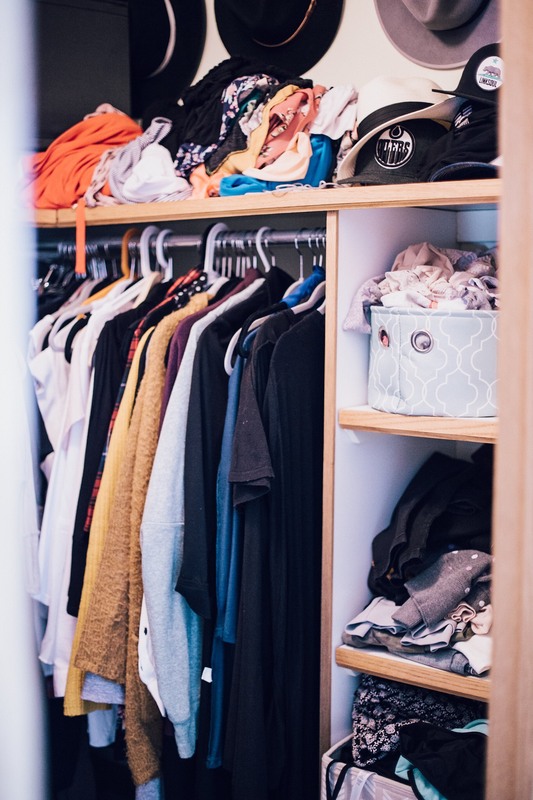 It’s a sentiment felt by all at some point or another, the anxiety of too much and never enough, and with the sudden cult-hit of Marie Kondo’s Netflix series, maybe now’s the time to reconsider what a functional closet actually looks like. Do we really need hundreds of pieces of clothing to carve out our sense of style or is that over consumption revealing itself in our own lack of imagination when it comes to getting dressed? 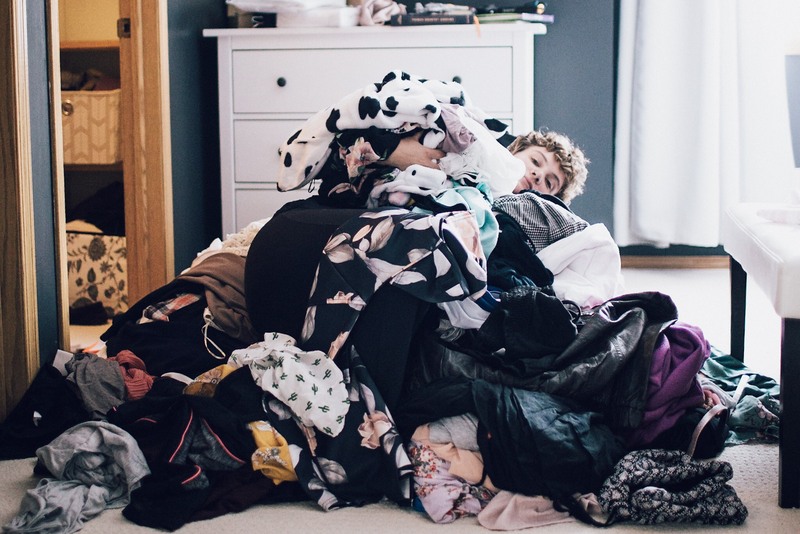 How much is too much, and will pulling everything you own out of your closet actually help? Gus Sloan founder, Lauren Dary, was asked these questions a few months ago as she undertook a massive closet overhaul. Her closet has gone from 246 pieces to a lean 34 pieces and she’s spilling the tea this week on her journey, the good, the bad and the wonderful. So pour yourself something to drink and settle in for this must read tell-all experience. What sparked this wardrobe upheaval? I am the founder of a clothing brand that is deeply rooted in the slow fashion movement and despite spending years adjusting my purchasing behaviours and views on fast fashion, I was finding myself endlessly staring into this black hole that was my closet. I felt like I wasn't fully practicing what I was preaching, and I didn't feel good about that. I still had so much stuff - a lot of it I barely ever wore or (gasp) still had the tags on. It gave me anxiety but at the same time, I didn't want to 'get rid' of anything. I read the book 'Over-dressed' by Elizabeth Cline and in the book she does a closet audit. I knew right then and there that I needed to do it. I needed to investigate everything in my closet, find out where the garments came from, analyze the data and see what was really going on. I felt like putting every single garment I owned into a spreadsheet would bring me the clarity I needed to fully immerse myself in slow, sustainable fashion. Spoiler alert: it did. Emotionally, how would you describe the experience? It was completely overwhelming. After taking everything out of my closet and putting them into a pile on my bedroom floor, all I could do was stare. Stare at this giant mountain of fabric. I couldn't actually believe how much I had. It took me days to go through everything. As I went, I inputted every piece into a spreadsheet full of data - where it was made, what it was made of, the approx. year and dollar value, how many times it was worn, etc. I felt shame and guilt. I tried my best to practice empathy and compassion for myself, but if I'm honest it was a whole bag of negative emotions. But, I will say that the clarity the process brought was well worth it. Were there things that surprised you as you worked through overhauling your wardrobe? Purchases you forgot, patterns you noticed? I was most surprised by the garments that I love to look at but don't love to wear. I think this happens to all of us (thanks to societal pressure and the fast fashion industry), we see something at a store or on someone else that we LOVE, but it just doesn't quite work right for our body. Despite this, we buy it thinking, 'one day it will work. I'll wear it anyways. It's so cute'. We don't wear it. And even though these garments existed in my closet, they stayed hanging in there for way too long because of the 'someday' notion. My new rule is this - If I'm not going to wear a new purchase TOMORROW, it's not worth buying. It will get lost in my closet. It's not worth it. Another pattern was where my clothes were made. Almost every single thing was made overseas. I think it's important to note that this didn't at all surprise me, but it SHOULD have. And that bothers me. Moving forward how will this impact the way you keep and add new things to your wardrobe? The things that are staying in my closet are the pieces that I actually wear and the garments that are (and will continue to be) a part of my journey. I never want to look into my closet again and think 'I have nothing to wear' as I stare at racks full of clothing. If I'm not wearing something, someone else could be. It could be a part of someone else's journey. It could be bringing someone else joy and confidence and swagger. I want that for garments. I want garments to have a story and to be a part of someone's life. If we start to think of clothing this way, the way we consume will be drastically different. In terms of pieces I will add to my wardrobe - my goal is to buy only what I can't make for myself. I want my wardrobe to be intentional and I want to wear each garment I have until it can no longer be mended or worn. Emotionally how do you feel now? It's a journey. I still get sucked into the online shopping trap through targeted ads. I still make it all of the way to an online shopping cart before I snap back to reality and close the browser because it isn't something I need. To change our shopping behaviours and the way we consume is not like flipping a switch. I feel more empathy for myself now. I know it's a process and I'm not perfect. It always comes back to the word 'intentional'. I think of slow fashion as 'intentional' fashion. I want all of my purchases to be intentional. I want where I spend my money to be intentional. I want to be intentional about the brands I support. It's a slow process, but change takes work. Are you happy you waited until now to tackle this project? Yes. I've done closet 'purges' in the past and this was so different. This was intentional and more for my own educational purposes. I wanted to evaluate my previous purchasing behaviours and where my money had gone and really see the details behind my purchases. One of the things I was most sad to discover is that I knew NOTHING about most of the brands I had purchased from. I didn't know their story or what their mission is or their WHY. These are all things that are incredibly important to me as the founder of Gus Sloan. We take extreme pride in our 'why'. I think that if I did this project sooner and without a real direction, all of the learning from it would have been lost. It would have been just a purge. But this, this was something so much more and so much more meaningful to me. Has this impacted you as a designer? Yes and no; I've always wanted my designs to be staple pieces, pieces that beg to be worn on a weekly or daily basis versus something you can only wear once-in-a-while. However, my creative mind can sometimes run wild and think up designs that aren't as practical and that's when I need to stay grounded in what we are trying to achieve. I don't want Gus Sloan jumpsuits to be disposable, forgotten at the back of the closet.I want people to love them so much that they wear them until they are falling apart. And then I want to be able to do whatever I can to mend them for our customers. Any business person on earth would probably tell me I'm doing it wrong, but if someone tries on a jumpsuit and I can tell they aren't fully sold, I ask them to wait and think about it. The last thing I want is for people to invest in one of our jumpsuits and then not wear it. It may not be the best protocol for sales, but I don't care. If you don't love the jumpsuit, don't buy it. We want our garments to be worn. And I definitely consider that with my whole heart when I come up with new designs and samples. Has this impacted how you see yourself, your sense of style, your sense of confidence in future style choices? After this closet audit project, I have more empathy for myself when it comes to learned behaviours. Change is difficult. Change takes time. My sense of style has always been constantly evolving. I got through more adventurous stages and then sometimes I'm more casual or more eclectic. What I'm learning is that my closet should work for me through whatever my sense of style is yearning for, instead of feeling pressure to buy something 'new'. I want pieces that I can style in different ways depending on my mood. I want to invest in these pieces - pieces that can be worn through different seasons of the year and different seasons of my life. Shoes, hats and jewelry can go a LONG way to help with this, too. Oh and one more thing - how would you rate the whole process on a scale of 1-10? 11. But only because I went into it with an open mind and with INTENTION. If I had done it any other way, I think it would be have been a bust. If you’re thinking of auditing your closet, then let us know! We’d love to learn more about the trials and tribulations, the pieces you love and keep coming back to, and how this process has affected your sense of style. 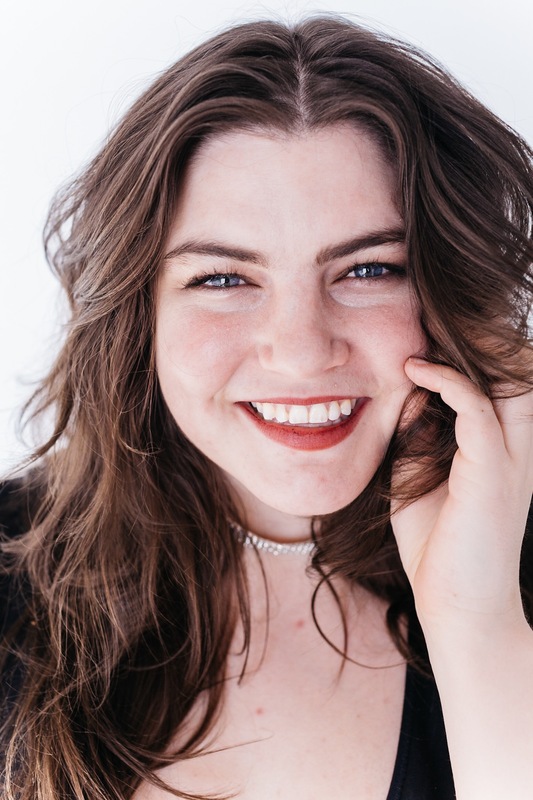 And if you have questions for Lauren be sure to reach out to her on social media or drop us an email - we’re an open book and would love to help you reclaim your closet! Finally, for those in the Edmonton-area, Lauren will be at The Wardrobe Exchange March 22-23 selling pieces from her recent closet overhaul AND Gus Sloan samples. Tickets available through EVENTBRITE or at the door.